Drawn to the Word is a dynamic expression of your ministry brought to life through art. It’s a live painting on a massive canvas, a communal artistic experience, or furthering Biblical education through workshops and retreats. It’s your purpose coming alive in hearts of your people. Use art to engage people and ignite hearts. Please peruse the gallery of Paul Oman Fine Art artwork. Grab an original before it’s gone. Online tutorials and in-person workshops and retreats are excellent ways to build a new skill set or hone your growing artistic ability. 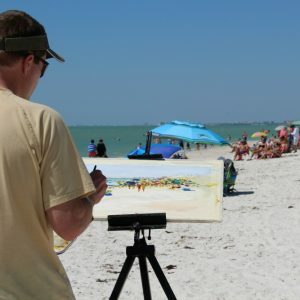 You will learn the foundations of painting as well as how to make your painting sing as you’re encouraged to bring your own voice to your work. View the gallery of original paintings for sale. Browse the shop for items to enhance your space and worship experience. You can also find Paul’s Original Painting exhibited at these Fine Art Galleries. "I'm not artistic at all, but I get to have a little share in something that is going to be a really big thing!" "It's fun working together with everyone on the mural!" "What a joy-filled project! People of all ages, working side by side, with all levels of skill and mastery culminating in a vivid, artistic display of God’s rich promises for our lives." "The All-Community Mural was an exercise in community, grace, and living into the gifts given to us by our Creator God! 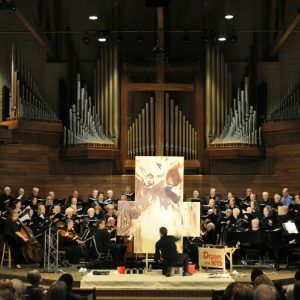 It was an experience full of the Holy Spirit - watching as people of all ages came together to touch brush to canvas, to laugh and talk and share, to unify their joy in the coming Savior in the creation of a work of art - a reminder that no matter who we are, Emmanuel calls us all to the same space: the foot of the cross." "As beautiful as our completed mural was, I believe the even more significant aspect of this project was the process used to create it. The simplicity of the mural's "paint-by-number" made it possible for both Sunday School kids and 80-year-olds to add their brush strokes to the canvas. As a community of faith, we worked side by side to create an extraordinary painting telling the story of God's love for us. Paul's design of the mural and encouraging oversight generated great excitement for all involved in the project." 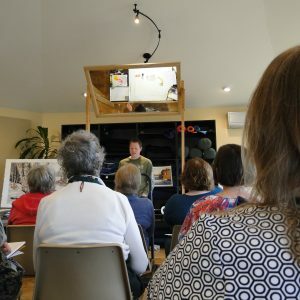 "The highlight of the project was the way people got involved, not just from our church, but friends from the community got interested in being part of the project." "Featuring Paul in our worship was one of the most engaging, meaningful experiences our congregation has had in years. Paul's gifts of painting and presence are amazing, and the good news shines through him." Very humbling and emotional. Extremely moving. Stunning, amazing and beautiful! Wow! Words cannot express how touched I am in my heart. If we have Paul again, I will invite 20 of my closest friends! Your ministry inspired faith in the new generation. This highest of priorities is fulfilled in what you do – Thanks be to God! My four-year-old was mesmerized for the entire time! She kept telling me every part of the story as Paul painted it. So emotional, it brought me to tears. The whole story came to life before my eyes! I was simply carried into prayer by the colors. Our Lord Jesus painted pictures in our minds when he told parables. Paul puts these depictions on canvas to bring Christ’s images to bear on our lives. Thank you for including the choirs in the powerful worship. Everyone is still talking about it throughout the community! I was amazed, and when completed I looked with amazement on the painting! Both young and old sat mesmerized. This is a great event for the whole church! We were truly blessed to have Paul come to our parish to paint the Road to Emmaus story during the Easter Season – an awesome experience! Captivating! Watching Paul open up the story of the Scriptures through his painting held our congregation spellbound. Paul’s heart shines through in a dynamic way as he allows the Spirit to create through him a Gospel message that jumps off the canvas and penetrates straight to the heart. It was a profound coming together of the audible and visible Word. My kids came home and told us all about it, how awesome it was! Jesus has called and is powerfully using Paul’s incredible gifts to revive a hunger for His living, active Word. That was the most amazing thing I have ever seen!